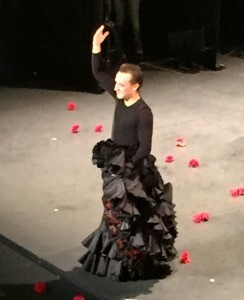 As the evenings grow dark and chilly here in the UK, thoughts turn to the New Year and the next flamenco Festival de Jerez. It is now such an international affair that festival-goers are anxious not to miss out on the more popular performances. Several folk have contacted me via this site to ask about how to get advance tickets, hence this post. The dates for the Festival are 25th February to 11th March 2017, these can already be found on the Ayuntamieto web-site (www.jerez.es) together with the list of available courses and who is leading them – there are forty-six during the fortnight of the coming Festival. 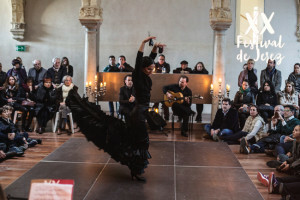 The diminutive Mercedes Ruiz (above right, pictured in Lamento, last year) is teaching basic level dance, which is immediately appealing, though the course is, I’m afraid, already sold out. As are the medium proficiency classes led by Manuel Linan (in Reversible last year, see left). 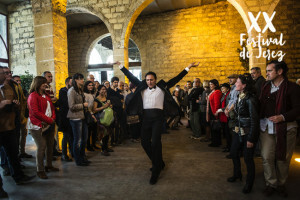 Antonio El Pipa is teaching too, though a specialist farruca course (medium proficiency) and there are a host of other well-established performers. Which is good news for festival goers, even if the classes are sold out, as it means they are all probably also going to perform at the Festival. 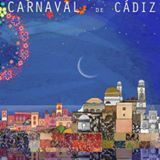 More good news is that Cadiz is holding its Carnaval from 23rd February to 5th March next year, so, if you’re lucky, or arrange things well, you might get to go the Carnaval as well as Festival. These two events coincided a few years ago and I, and a Festival going friend, decided to spend the day in Cadiz. We found ourselves joined, as our train stopped at each station, by Sixties hippies, Musketeers, male nuns and pirates. Train travel is free on the local service if you’re in fancy dress, though the done thing is to go in clearly defined groups and absolutely everyone dresses up on the first Saturday. sea-dog, complete with gold braid, peaked cap and pointed close-cut beard. Another in fancy dress, we thought at first, but as he walked by we decided he was probably the real thing, the captain of one of the ships in the harbour. We looked at our shoes and hurried by. Carnaval is an old celebration and governments of different colours have tried to stamp it out, or tame it, without success. This is mainly because of the chirigotas and comparsas, groups of singers who throng the city, singing on street corners and in squares and gardens and competing in the official competitions. Their songs are specially composed and very satirical. No-one actually sues for libel for things said or sung during Carnaval, but plenty would like to. The language is pretty ripe too, definitely a festival of mis-rule, but great fun. To return to ticket purchasing – the ayuntamiento web-site usually has links to their ticketing company and they are easy to follow (I’ve bought tickets this way before) and there is usually a dedicated site ( www.festivaldejerez.es ) which does likewise. Tickets for many events are still available at the Box Office on Calle Medina during the Festival, although the most popular events do sell out, so best to be early. Last year there were a lot of folk hoping for returns outside some of the events we attended, especially in the smaller venues. I will post about it when the Programme is out. This entry was posted in From a Foreign Field and tagged Foreign field, Worth a visit by juliej. Bookmark the permalink.